What the big telephone & cable companies don't want you to know. You can eliminate costly reoccurring lease line charges! Access Engineering’s primary goal is to provide alternative options to leasing communication circuits. We design private Fiber Optic and Wireless communication systems that the client owns and operates. with multiple sites located within close proximity to one another, you have or will assess your monthly telecommunication costs. While assessing these costs, it is wise to consider the potential for savings by implementing your own Private Communication Network to connect some or all of your sites. of successfully Installing Private Communication Networks on large and small-scale projects. We will work directly with you to assess your current and future communication Needs. We will show you how to reduce your communication costs with a unique Plan that will provide a positive return on your investment. 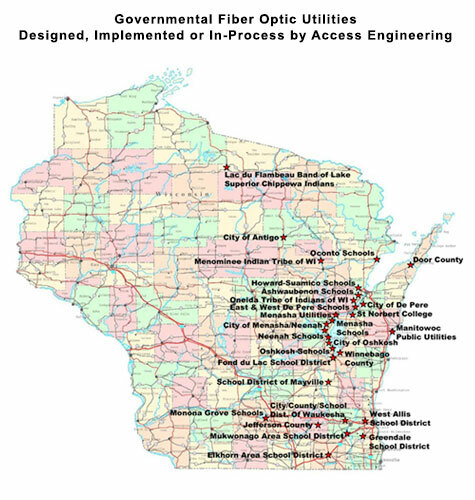 that telephone companies are so worried about this issue that they have been lobbying Wisconsin officials for the last 5-years to limit Municipal Organizations from building their own infrastructure!